Dr. Oetker is a German-based producer of baking ingredients, desserts, and frozen pizzas. The company operates in over 35 countries, with production facilities in 15, including Canada. It maintains a dominant market share here in Canada; as of 2017, Dr. Oetker’s frozen pizzas accounted for one of every three pizzas sold domestically. Until 2014, Dr. Oetker’s only Canadian production facility was in New Brunswick. Government funding programs played a key role in the company’s Canadian expansion. Seeing extraordinary demand in the Canadian market, Dr. Oetker expanded its Canadian operations to London, Ontario. Announced in 2011 and later opened in 2014, the company’s London plant is devoted to making oven-ready frozen pizzas. As a state-of-the-art facility, it will continue to serve as Dr. Oetker’s main production plant and is expected to increase production in 2018 due to the closure of Dr. Oetker’s less-innovative New Brunswick facility. Since Dr. Oetker announced it would expand into Ontario in 2011, it has been the recipient of many government funding programs. In fact, the company’s main decision to invest in Ontario was due to several key investment support programs, including Ontario’s Rural Economic Development (RED) fund. The Rural Economic Development program awarded up to $7 million in Ontario government funding to support Dr. Oetker in establishing a local supplier network. Dr. Oetker used the Rural Economic Development program to establish an Ontario-based supply chain of tomato, cheese, vegetable, and meat producers. With this network, the company reduced its cost to import ingredients while also supporting the local economy. This is a tremendous benefit for Dr. Oetker, as the retail food industry has faced increased challenges in recent years in terms of both price and cost. Other government funding programs accessed by Dr. Oetker include FedDev Ontario’s Prosperity Initiative, as well as Agriculture and Agri-Food Canada’s AgriProcessing Initiative. These awards directly offset the costs of establishing the London, Ontario facility and allowed Dr. Oetker to adopt new, innovative technologies. To support Dr. Oetker’s $113 million investment, the Government of Canada awarded $10 million through its Prosperity Initiative and another $2 million through the AgriProcessing Initiative. 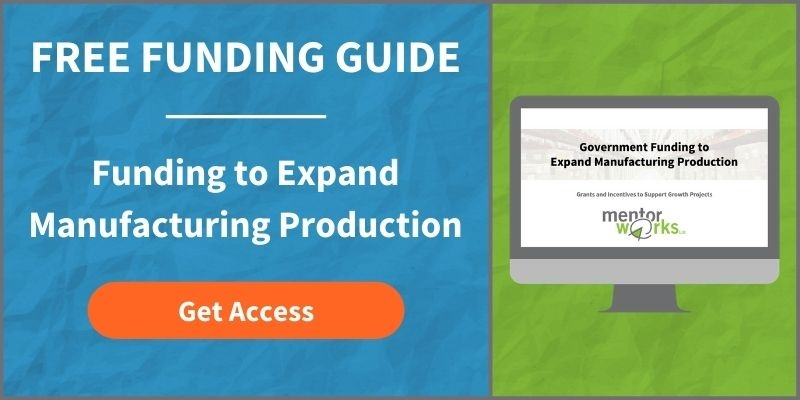 Although these two programs are no longer available, companies should be aware that other government grants and loans exist to offset the costs of manufacturing expansion projects. When it opened in 2014, Dr. Oetker’s London, Ontario pizza production plant was the company’s second in Canada. Another facility, located in New Brunswick, also manufactured frozen pizzas until early in 2018, when the company announced it would stop production and relocate most of its output to Ontario. Dr. Oetker chose London as the head of production because of its state-of-the-art facility, efficient equipment, capacity for future expansion, and integrated supply chain. Government funding programs played a key role in ensuring Dr. Oetker kept operations in Canada. By investing in capital projects like new facility development, large-scale food manufacturers can improve business competitiveness and better respond to market opportunities as they happen. Dr. Oetker’s New Brunswick facility closed because, unlike its Ontario counterpart, it was leased and did not provide the level of innovation required for future production. Ontario food processors have access to multiple sources of government grants and loans which can offset the costs of expanding production. Although the programs mentioned above are no longer available to businesses, the federal government recently released new support options as part of the Canadian Agricultural Partnership (CAP) program. AgriMarketing: Offers up to $50,000 in agri-food industry grants in support of food producers or processors expanding exports by attending international trade shows. Companies may offset common expenses related to trade show participation, including exhibition costs, travel to the market, and development of promotional materials for international audiences. AgriInnovate: Provides up to $10,000,000 in repayable funding contributions to support agri-food businesses investing in innovative product, processes, or services. Through the commercialization or adoption of technologies, companies can overcome internal technical challenges, improve products, and drive productivity. To learn more about the types of projects companies can deploy to access Canadian government funding, please download the Key Tips: Expanding Production in Canada slide deck.